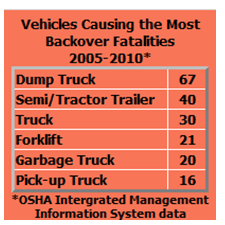 How do backover incidents occur? Backover accidents can happen for a variety of reasons. Drivers may not be able to see a worker in their blind spot. Workers may not hear backup alarms because of other worksite noises or because the alarms are not functioning. A spotter assisting one truck may not see another truck behind him. Workers riding on vehicles may fall off and get backed over. Drivers may assume that the area is clear and not look in the direction of travel. Sometimes, it is unclear why a worker was in the path of a backing vehicle. A combination of factors can also lead to backover incidents. What can be done to prevent backover incidents? Many solutions exist to prevent backover incidents. Drivers can use a spotter to help them back up their vehicles. Video cameras with in-vehicle display monitors can give drivers a view of what is behind them. Proximity detection devices, such as radar and sonar, can alert drivers to objects that are behind them. Tag-based systems can inform drivers when other employees are behind the vehicle and can alert employees when they walk near a vehicle equipped to communicate with the tag worn by the employee. On some work sites, employers can create internal traffic control plans, which tell the drivers where to drive and can reduce the need to back up. In some cases, internal traffic control plans can also be used to separate employees on foot from operating equipment. Training is another tool to prevent backover incidents. Blind spots behind and around vehicles are not immediately obvious to employees on foot. By training employees on where those blind spots are and how to avoid being in them, employers can prevent some backover incidents. One component of this training can include putting employees who will be working around vehicles in the driver’s seat to get a feel for where the blind spots are and what, exactly, the drivers can see. The National Institute for Occupational Safety and Health (NIOSH) several blind spot diagrams that can help explain what drivers of various large trucks can see.